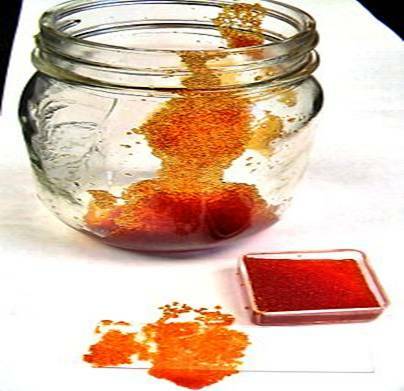 An ion-exchange resin or ion-exchange polymer is an insoluble matrix (or support structure) normally in the form of small (1–2 mm diameter) beads, usually white or yellowish, fabricated from an organic polymer substrate. The material has highly developed structure of pores on the surface of which are sites with easily trapped and released ions. The trapping of ions takes place only with simultaneous releasing of other ions; thus the process is called ion-exchange. There are multiple different types of ion-exchange resin which are fabricated to selectively prefer one or several different types of ions. Ion-exchange resins are widely used in different separation, purification, and decontamination processes. The most common examples are water softening and water purification. In many cases ion-exchange resins were introduced in such processes as a more flexible alternative to the use of natural or artificial zeolites. Most typical ion-exchange resins are based on cross linked polystyrene. The required active groups can be introduced after polymerization, or substituted monomers can be used. For example, the cross linking is often achieved by adding 0.5-25% of divinylbenzene to styrene at the polymerization process. Non-cross linked polymers are used only rarely because they are less stable. Cross linking decreases ion- exchange capacity of the resin and prolongs the time needed to accomplish the ion exchange processes. Particle size also influences the resin parameters; smaller particles have larger outer surface, but cause larger head loss in the column processes. Besides being made as bead-shaped materials, ion exchange resins are produced as membranes. The membranes are made of highly cross-linked ion exchange resins that allow passage of ions, but not of water, are used for electro dialysis. - Two mild steel pressure vessels internally linedwith rubber, provided with internal fittings and initial charge of cation and anion exchangeresins. - One set of regeneration equipment including hydraulic ejectors, acid and alkali tanks. - One set of frontal pipework and valves. - One orifice board to indicate regeneration flows. -One dial-type electrical conductivity meter tomonitor treated water quality. - One motor-driven air blower of adequate capacity to mix the ion exchange after regeneration. to cater to different types of raw water. Degasser modules for the range of CA units are also available. These are useful for raw waters containing a significant amount of alkalinity. - Two mild steel pressure vessels internally lined with rubber, provided with internal fittings and initial charge of cation and anion exchange resins. - One set of frontal pipe work and valves. - One mild steel base frame for mounting cation and anion units . - One conductivity meter to monitor treated water quality.